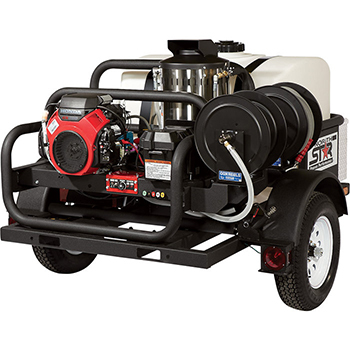 This NorthStar Hot Water Pressure Washer with self-contained 200 gallon water tank delivers hot water washing anywhere! Perfect for remote job sites with no electricity or running water. 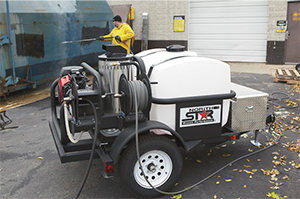 Honda GX630 V-twin engine powers CAT pump to deliver hot water at 4000 PSI for effective cleaning. Horizontal shaft engine is engineered for long life. Cat direct drive pump has brass manifold and ceramic plungers. Coil assembly is fully encased in a custom-molded ceramic fiber refractory combustion chamber with low thermal conductivity and resistance to thermal shock. Parker Hannifin Racor fuel filter and water separator prevents burner ignition problems. Diagnostic lights signal operation of key components. Rear hose-entry spray gun with split lance keeps the hose out of the way for easy handling. – Ultimate reliability and higher horsepower. – Easy-start convenience, greater fuel efficiency, longer run time. – Ceramic plungers to provide maximum resistance to corrosion. 2 Built-In Hose Reels: 150′ High Pressure, 100′ 3/4″ Garden Hose. 12V Diesel /Kerosene Burner With Schedule 80 Heating Coil. Uses diesel, kerosene, #1/#2 fuel oil to heat water to 210°F. 200 Gallon Water Tank – Perfect for remote job sites with no electricity or running water. – Complete with lights, torsion axle suspension, fenders & jack.